I am really excited to say that this baby quilt version of the Diamonds in the Deep pattern is currently on its way to my “sister” in anticipation of the arrival of my nephew in June. I used Kona solids for the front: Royal Blue, White, and Lime. I really like how the splash of lime in the center of the blocks adds a nice punch of color and detail to the pattern! The backing is a coordinating print I found at Backside Fabrics. The pattern consists of courthouse steps style pieced log cabin blocks placed on point. Each main block has 16 seams, and even with chain piecing the blocks take a bit of time to assemble. Nothing too unreasonable; but worth noting in case you are looking for a faster project. I used a 50wt Mettler royal blue thread for the quilting. The quilting is what I call the “robot” pattern: an all-over box meander. I like the juxtaposition of the blocks set on point and the quilting rotated 45-degrees to the points on the blocks. Linking up to TGIFF (hosted this week by Simply Pieced), WIDTW, and Can I Get a Whoop Whoop (buttons to the right). Yes! You get a huge Whoop whoop! That is fantastic and the quilting is just so right for the pattern. That’s a great looking quilt. The backing fabric is perfect. I’m betting that these pictures pale in comparison to the real “live” quilt! She is lucky to have you as a friend! ! ! It’s a really cool pattern and I love the colours that you chose. The quilting is the perfect finish especially using the blue thread. Looks absolutely fabulous! Congratulations on a fantastic finish! 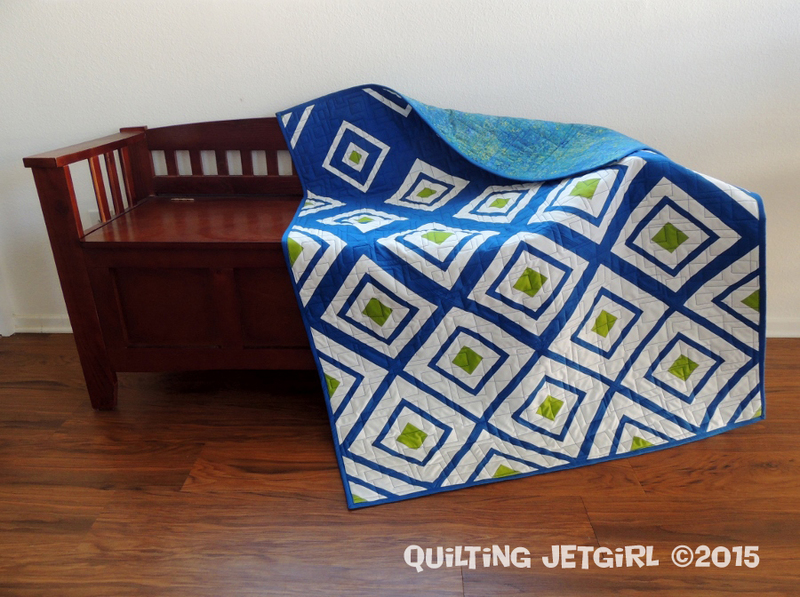 I do like the color blocking in that quilt, and “robot” quilting! How cute! The movement makes the quilt look like it is moving away from you! You do that box quilting design so well! My brain works better on curvy designs. 🙂 This is another great finish Yvonne! I really like the way the color fades from blue blocks to white blocks and that lime is just perfect. Nice work!! Did you do the quilting on the long arm? Wow! It seems like you just got that fabric. Your design is awesome and your quilting fits it perfectly. What a lucky nephew to be. Great colors & design Yvonne! Outstanding! I love the crisp graphic look, and the quilting is perfect for it, really enhances the overall design. This is gorgeous! Love the design. Baby’s gonna love this for many, many years to come! Great quilting on it too! Its actually perfect! Beautiful!! That lime really makes it pop! And the blue thread for the quilting was the perfect choice! Congrats on a truly awesome finish! Love that lime, great colour choice. Makes a great gift too! What a great finish! Ditto to everything above. I like the optical illusion — at least I think all the lime squares are the same size, but as the colors change they look different. Oh, those colors are perfect together! Very cool pattern too! Fantastic quilt!! I really do love that lime in the center too. 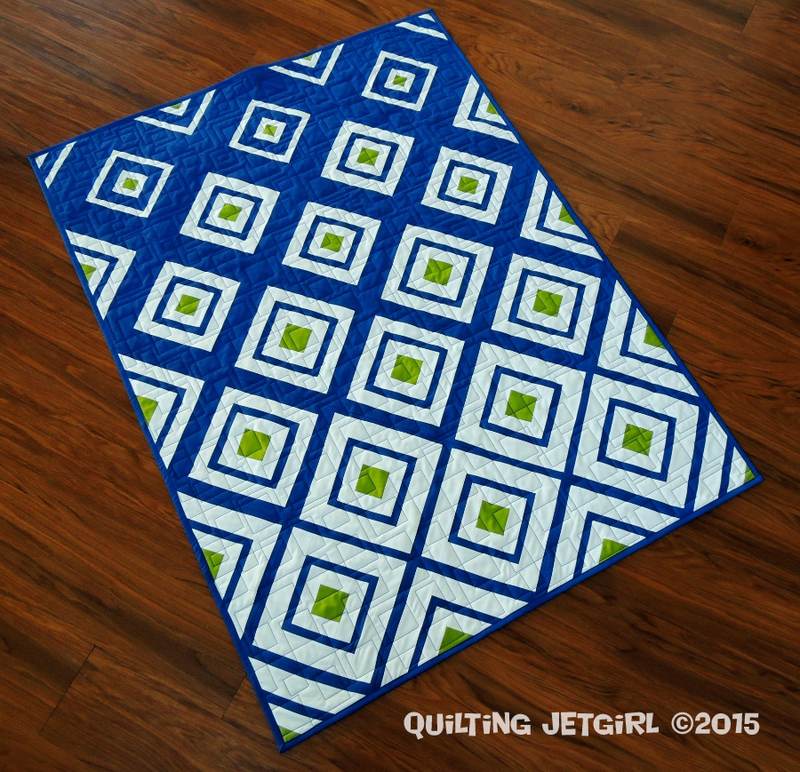 That quilting is the perfect compliment, and I love that it’s in blue. As always, beautiful work! Wow! The solids really make the pattern pop. Love this! It turned out so nice! 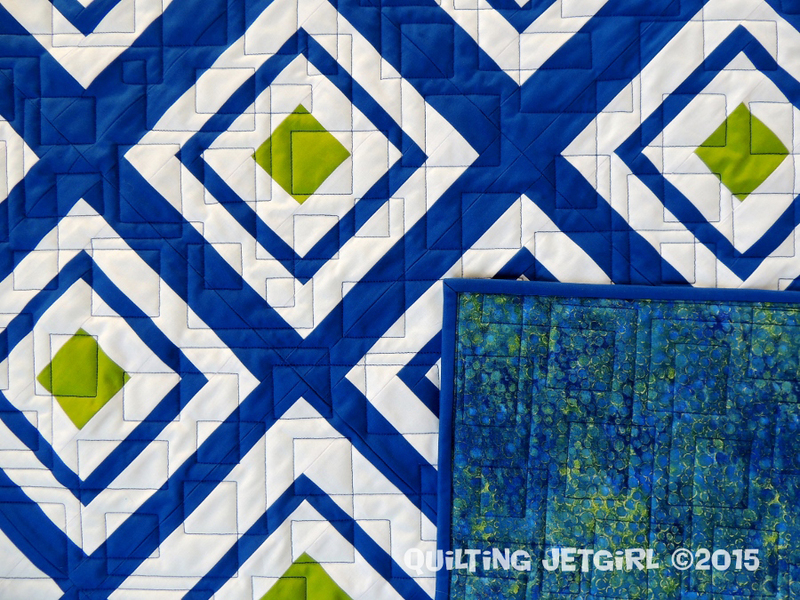 I love the way the blocks transition from blue to white, and the quilting adds the coolest texture! And it looks so cool on the back! This is just gorgeous! I love baby quilts that don’t scream baby and can be loved for many years. The mottled back is a great complement to the crisp, geometric front. Whoop whoop for sure! Your “sister” and her little boy are so lucky to have you for an Auntie. I really liked this pattern when I first saw, but now that you threw that little bit of color in there, I gotta have one! Lucky sister to get just a beautiful quilt. Great finish! What a beautiful quilt! 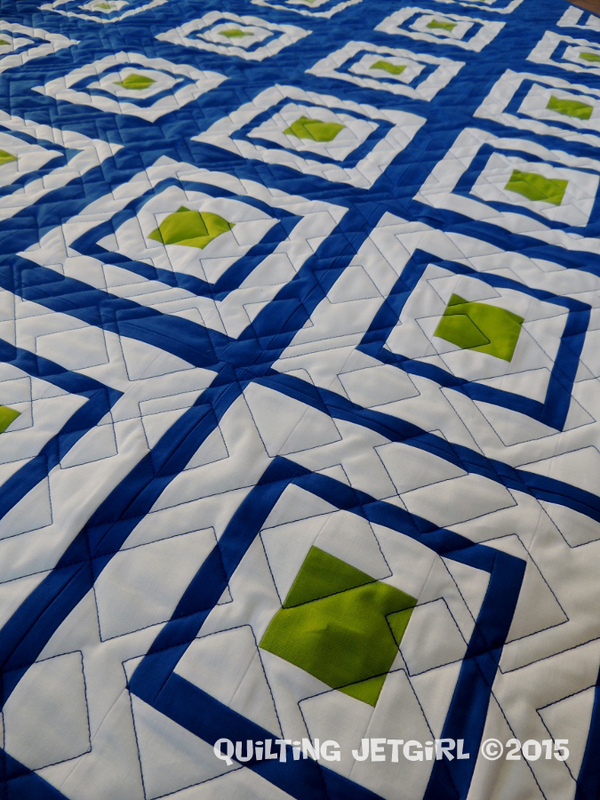 I really like the blue with the lime green in the center of the blocks… the quilt really pops. I love the quilting you did on it! Man, this is one great looking quilt. I love the visual effect that it has and using just solids makes the colors and pattern that more impactful. Your “sister” is going to love it. That is so cool Yvonne how the diamonds disperse and grow smaller – a bold and beautiful quilt! Really Love the way you quilted it! I love how you’ve done this – the lime is such a great touch! That is a beautiful quilt and the PERFECT quilting design to add to it. Lovely! Looking good and your quilting is great! Well done! This turned out FANTASTIC. I love the rich blue and the pop of lime as you stated, perfect pop of color! I love the gradient effect as well. Perfect quilt for the new family member to love on arrival! This is when catching up late is good, I get to see the quilt without having to wait! And it looks brilliant, I really like the quilting in that blue, very crisp and effective. I love this! I’ve been eyeing this pattern for awhile and I SO appreciate that you listed the times it took for you to complete each step. I really want to make his quilt and I thing the baby size will be quite reasonable!